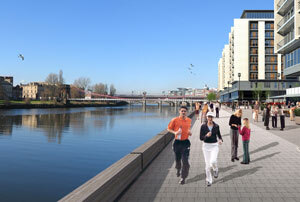 The planning application to develop Custom House Quay in Glasgow has been lodged today (27 April 2004). Custom House Quay is the 1.25-hectares riverfront in Glasgow’s City Centre, which lies on the south side of Clyde Street between the Glasgow and Victoria Bridges. The site – combining Custom House Quay, Custom House Gardens, and Carrick Quay, forms Glasgow city centre’s main frontage to the River Clyde. The £200 million development, designed by the Glasgow office of the internationally acclaimed architectural practice, RMJM, will offer a mix of residential, leisure and retail and will regenerate the riverbank near the city’s Portland Street Suspension Bridge, introducing a dynamic mix of activities to this important part of the city. It will also breathe new life into Clyde Street by giving it new and real purpose. It is widely recognised that this area is currently not just ‘run down’, but also unsafe and largely avoided by the public. The new development will provide more public realm space than is currently provided, will be of high quality, more accessible and safer, encouraging increased public use of the area. The development will redefine the quayside and provide flood protection unlocking the potential of this site to become one of Glasgow’s prime locations, enabling its people and visitors to experience the river as an active part of the city centre. Clydeside Properties has also demonstrated real commitment to the city through consulting with key bodies. A number of public meetings will also be held in the coming weeks and research has already been professionally conducted interviewing people who live in and use the wider area and who may be affected by its redevelopment. There have been consultation meetings with a number of interested bodies particularly the Archdiocese of Glasgow whose Cathedral Church of St Andrew lies at the heart of the new development. Commenting on the proposal for Custom House Quay Archbishop Mario Conti said: “While the loss of the river promenade in Clyde Street would, in itself, be regrettable, it does not in fact attract any significant number of people and is regarded as unsafe. 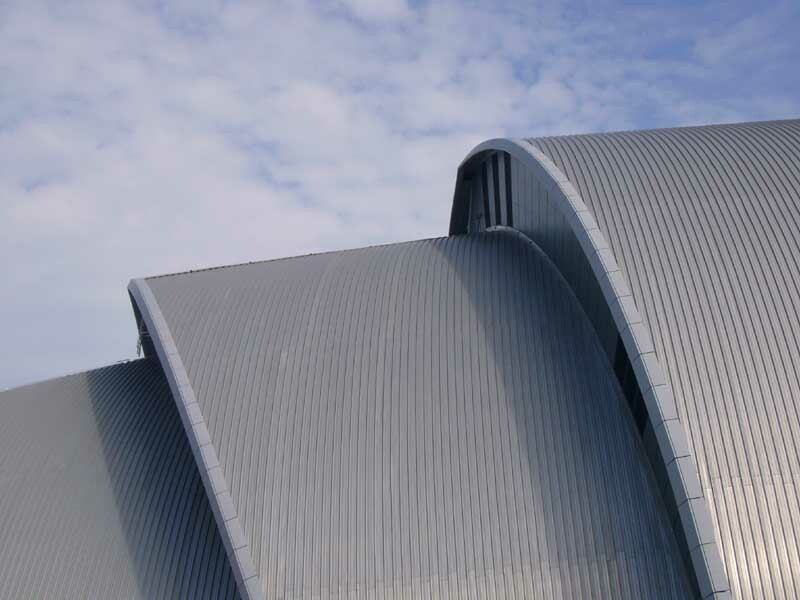 Glasgow based Babtie Group, one of the leading technical and management consultancies both in the UK and internationally, has conducted a wide ranging and in depth Environmental Impact Assessment (EIA) of the proposals. This has included detailed assessment of issues such as planning policy, ecology, water quality, flood risk, visual impacts, transport and cultural heritage. · A four star hotel with approximately 120 rooms. The hotel will have a generous front of house provision of bar, restaurant, meeting rooms, and gym, used not only by hotel guests, but also by residents and visitors to the area. There will also be a floating timber decked pontoon at the quayside between the hotel and residential tower, enabling closer pedestrian access to the river edge and providing mooring locations for small vessels such as floating restaurants. · 6 residential buildings, plus a landmark tower building, providing a total of 348 one and two bed apartments and penthouses. · Key Worker Building. Clydeside Properties (Glasgow) Ltd is currently involved in projects throughout the UK, which are specifically ‘keyworker’ where affordable housing to public sector workers is provided. A new product is being developed which allows public sector workers to own a 2 bedroom flat, with a lower repayment figure than they would be likely to pay to a Registered Social Landlord or Housing Association. · Nursery Facility. The developer is in discussion with a specialist nursery operator that provides day-care for children from 12 months old and can normally provide 45 to 60 spaces with a ratio of 1 carer to 3 children. It is believed that there is a shortage of this type of facility in the city centre. · Retail and Leisure. There will be a vibrant mix of high quality operators at ground floor. The development is committed to establishing an appropriate riverside ambience through incorporation of galleries, cafes, bars, retailers, a hotel, a nursery, and restaurants. The overall aim is to create an extension to the established retail district of Glasgow to the riverside and incorporating Clyde Street. In order to achieve this and to increase its ‘dwell’ time there will be a range of restaurants, cafes and bars to suit all pockets. Clydeside Properties (Glasgow) Ltd has a track record in distinguishing its develpments from other high streets by bringing quality local operators, as opposed to chain operators, to its developments. Once complete Custom House Quay will be a focus of retail and leisure activity from 7am till midnight creating a safe and enjoyable environment for both residents and visitors. The secondary aim is to service the apartments within the development (and other local inhabitants) with all of the amenities necessary to support urban living. This will help to foster a revival of the riverfront. The third aim is to enliven the waterfront and the public squares created with a mixture of high quality and necessary amenities and a wide riverside walkway encouraging pedestrian traffic along the embankment. Hours of operation are likely to be as similar uses in the city. This will be established through consultation with the appropriate statutory bodies. · Employment. The number of staff employed directly during the construction period is likely to vary from say 50 to a peak of say 300 skilled workers. These estimates are likely to vary significantly depending upon the operators and peak/off peak requirements. · Car parking. There are 2 underground car parks; both are accessed from Clyde Street, one ramp close to Victoria Bridge in the East, and one close to Glasgow Bridge in the West. The access points and arrangement have been determined through consultation with the City Council Land Services. There will be 185 spaces. It is anticipated that once planning permission has been achieved it will take 2.5 years to complete the development of Custom House Quay. Up until the mid 1800s trade activity on the river was confined to the Broomielaw quayside and did not reach as far as Custom House Quay. To make upriver of the Jamaica Street Bridge viable for ships the River Act was introduced to determine that Glasgow Harbour should be extended to the Stockwell Street Bridge that became Victoria Bridge when it was rebuilt in the early 1850s. The act also said that the Harbour should include Custom House Quay. By the early 1860s Custom House Quay was in full operation with several cranes working on the quayside. A goods shed had been built between Jamaica Street Bridge and the Suspension Bridge (which was built in 1851-53 to ease pedestrian traffic across the river). As activity increased towards the end of the 19th century the quayside at Custom House Quay had to be strengthened with sheet piling driven into the riverbed and a new concrete face poured against the existing quay. The goods shed was then enlarged and a further two sheds were built east of the footbridge. In addition, Ordnance Survey maps of 1896 show weighing machines, crane seats on the quay edge and a line of mooring posts. It is clear that by the end of the 19th century Custom House Quay had been transformed from a pleasant riverside promenade along which some of the more privileged citizens might stroll to a commercially active wharf. Coastal lighters and some smaller steam vessels (‘puffers’) serving the West Coast trade berthed at the quay. Goods such as coal, granite, gravel, and sand were regularly unloaded. Custom House Quay continued to be a place of commercial activity until the 1950s and 60s. In the 70s it was landscaped producing the urban wilderness that we see today. At Custom House Quay the developer plans to provide 72 two-bedroom key worker apartments in the region of £100k. There will be no deposit required, which is the normal barrier to keyworkers buying their own apartments. There will also be some shared amenity space provided for the keyworkers at ground floor level. The residential buildings, which are 15m wide and 25m long, respond to the street pattern on the north of Clyde Street. These create the general rhythm along the site with 18m spaces between the blocks to satisfy privacy requirements and grouped in threes with a square between responding to St Andrew’s Cathedral. The scale of these buildings picks up on the datum established at the Broomielaw, although with a more slender and permeable proportion in response to the local context. The groupings provide a similar scale to that of Carlton Place in addressing the scale of the river, although with a scale clearly identifying the north as the city centre. Based on current market values, one-bedroom apartment will start at approximately £110,000 and two bedroom apartments will start at approximately £175,000. The development encourages a green transport strategy with a car free policy for the commercial, retail and key worker accommodation as discussed with Glasgow City Land Services to assist in the use of public transport, cycling and pedestrian movement.